Has the cilantro (aka coriander) in your garden gone from leafy and fragrant to tall and spindly? It’s probably the summer heat and a natural part of the cilantro life cycle. Cilantro is a cool weather plant and thrives in spring and autumn. When the summer temperatures start to go up, the plant stops producing leaves and starts producing seeds, otherwise known as bolting. If you let it go, you’ll find plenty of round green seeds at the tips which will slowly dry and turn brown. The brown seeds come off quite easily, I just grab the stem and gently pull upwards and they come off in handfuls. I set the seeds aside and plant them next season, though I also let some fall on the ground and sprinkle a little dirt over them to try for another round of plants. 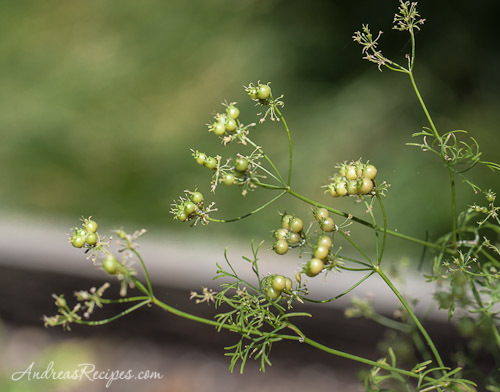 If you want to grow cilantro in the summer, use a slow-bolting seed variety such the kind sold by Renee’s Garden (not sponsored), and keep it in a partially shade spot. The leaves don’t last as long as they do in spring or autumn, just keep an eye on the plants and make to use them before they bolt. Happy gardening! Thank you for this advice. I have been hoping to grow cilantro year round, but have not been able to grow leaves in the summer. I will try a shadier spot! It’s sad when the cilantro starts bolting but I do love harvesting fresh coriander seeds later!